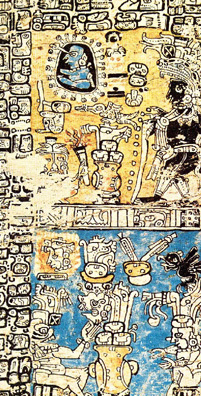 The Codex Troano with 70 pages and the Codex Cortesianus with 42 pages are joined together as the Madrid Codex whose 112 pages make it the largest known book of surviving Maya hieroglyphic literature. "The book came to light a century ago. By then it was in two widely separated pieces, then thought to be distinct books. As such they were published in very limited editions from 1869 on. For instance, only 85 copies of the photographic edition of the Cortés part of 1883 were published. At last in this edition we have the first screenfold colour reproduction of the whole book." Graz 1967. Vol. 8 of the series CODICES SELECTI. True-color facsimile edition of both sections of the hand painted Maya picture book in possession of Museo de América, Madrid. 112 folded book pages. Format: 125 x 230 mm, total length: 6,82 m, folded continously in PreColumbian screenfold format (over 19 feet long). German commentary by Dr. F. Anders, 54 pages introduction plus a concordance table as well as an additional color plate.